Join the growing army of volunteers who will get together this spring with one huge mission in mind — to win the war on plastic. 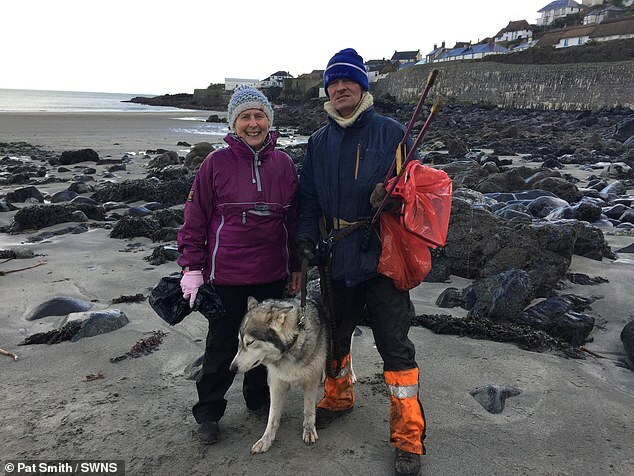 As Prime Minister Theresa May pledges her support, it’s time for you to sign up and join The Great British Spring Clean, a nationwide plastic pick-up in partnership with the charity Keep Britain Tidy and endorsed by a host of naturalists, including Sir David Attenborough, Chris Packham and Bear Grylls. This year’s event will take place between Friday, March 22 and Tuesday, April 23 — and we are asking you to join with friends, family, colleagues, schools and faith groups to tackle the blight and turn the tide on plastic. Last year’s Great Plastic Pick Up was a great success and a credit to our wonderful band of dedicated readers who made a real difference. More than 20,000 people filled 17,000 wheelie bins with rubbish and picked up two million plastic bottles for recycling over one weekend. But there’s more to be done and, this year, we hope to see at least half a million people picking up litter. The scourge of plastic is still infecting our streets, beauty spots and beaches. For more than ten years, the Mail has campaigned to end the blight of plastic bags clogging the oceans, killing birds, poisoning fish and threatening human health. Today, there’s been an astonishing 85 per cent reduction in the number of plastic bags used. And now, the Mail is supporting The Great British Spring Clean, helping communities come together to tackle plastic waste and litter. Taxpayers spend £800 million every year clearing up after thoughtless litter louts and fly-tippers. So, even if you live miles from the nearest beach, your efforts will be making a major contribution to protecting the world’s oceans from the scourge of plastic trash. It’s estimated that 80 per cent of the plastic in the world’s oceans originated on land. Wherever you are, you can make a difference by sparing just a few hours to pick up plastic in your area. Schools can also do their part. It’s so simple to sign up — just log on to gbspringclean.org and do it today. WHAT’S HAPPENING AND HOW DOES IT AFFECT ME? The Great British Spring Clean is running for a month, from March 22 to April 23, 2019. We have got more than 300 local authorities on board supplying or lending equipment and arranging for safe disposal of the collected rubbish and recycling of the plastic and metal found. Communities can come together in small groups or as individuals on any day during that month to pick up rubbish, with the specific mission to remove the plastic that so often ends up in the ocean. Of course, we’ll be removing other litter, too, giving Britain a proper spring clean. Across the country, we’ll be cleaning beaches, town centres, parks, woodland areas — anywhere you’ll find litter. HOW DO I SIGN UP TO PLAY MY PART? Visit gbspringclean.org where you will find all of the information you need and all the details to join in — you just need to provide your name, address and an email. You can pledge to contribute to the campaign as an individual by picking up as much litter as you like, whenever you like, at any point during this year’s month-long campaign. You can organise a clean-up with friends, neighbours or community groups. Why not organise a litter pick with your workplace, place of worship or book club? It couldn’t be easier. You can join an organised clean-up group in your area. In the coming weeks, groups will be set up and their details added to a special interactive online map. Click on the map to find out details and to let the organiser know you’ll be joining in. They will liaise with you directly about the clean, including timings and any equipment needed. If there’s no group in your area, sign up anyway to pledge your support. New clean-ups will be appearing on the site every day, so you can always go back and see if one has been set up near you at any time. HOW DO I REGISTER A GROUP PICK-UP? If you’re keen to organise a private group of friends, family or work colleagues, just select the PRIVATE GROUP option when registering at gbspringclean.org. This means you will have access to a fully comprehensive guide, with step-by-step information on how to organise your pick-up event, where to do it and what you need, plus great advice on running a successful pick-up and ensuring everyone stays safe. We are also urging all hosts to visit the website after each event to let us know how much litter was successfully collected and how many volunteers were involved. Because your event is private, only people you invite will be able to join your group. You can organise as many clean-ups as you want between March 22 and April 23 at any number of locations, dates and times. Follow Keep Britain Tidy on Facebook, Instagram and Twitter or subscribe on YouTube to see what others are doing and share posts from your own account using the hashtag #GBSpringClean to inspire others to take part. 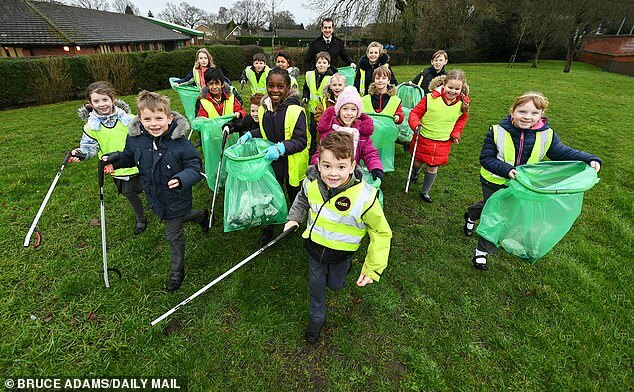 Last year, hundreds of thousands of schoolchildren took part — and teachers said they had the time of their lives, as well as doing their bit to clean up. This year, we are calling on even more schools to take part — and one lucky school that joins The Great British Spring Clean will win £1,000 of Wilko products. It starts with the Great Big School Clean day of action on March 22, the first day of The Great British Spring Clean. All of the schools that take part will be entered into a draw to win the £1,000 prize. (If you cannot do your clean-up that day, don’t worry — you can do a Great Big School Clean on any date up to April 23 and your results will count.) It’s easy: just join up at keepbritaintidy.org/gbschoolclean, where you can access lots of great resources and useful guides about how to do a safe and successful school clean-up. SO WHAT HAPPENS WHEN I REGISTER? When you sign up to The Great British Spring Clean, you can keep track of everything on your own personalised online ‘dashboard’. This is your own space where you can add clean-ups, access useful guides and find out what to do with your rubbish. This is also where you can go after you’ve done your clean-up to record your results.
. . . AND WHAT ABOUT THE EQUIPMENT? If you need litter-pickers, high-vis vests, bags or gloves, your local authority may be able to help you — many of them will even lend you the equipment. Just say: ‘I am planning to take part in a community litter-pick, can I ask about borrowing some litter-pickers please?’ Or you’ll find all the equipment at Wilko stores across the UK and wilko.com from February 4. Visit gbspringclean.org for more information on what you need. WHAT OBJECTS CAN’T I COLLECT? Never pick up needles — let the event organiser know about them and they will contact the council to remove them. Also leave broken glass and large fly-tipped items — let your local council know instead. Do not attempt a pick-up near busy roads or fast-moving traffic. WHERE DOES THE LITTER END UP? One for all other types of rubbish and waste. It will go to the local authority for disposal and recycling. CAN I SHOW OTHERS MY HARD WORK? When your pick-up comes to an end, give yourself a well-deserved pat on the back! Then count up and photograph the bags that you have collected. You can proudly post these pictures online with the hashtag #GBSpringClean. Group organisers should also go back to gbspringclean.org to log their number of bags and volunteers and to upload the photographs.